There are three basic methods of melting chocolate. Our favorite way is simply to put it in the oven at a very low temperature. This results in chocolate that is easy to handle and minimizes the possibility of producing lumpy, unevenly melted chocolate. We know what you’re thinking. You already know how to melt chocolate. Maybe, Smartypants. But maybe, just maybe, you and I and all of us could stand to benefit from an unexpected approach to something we thought we understood. Because really, that oven technique described above? Brilliant. If melting in the oven: Heap the chopped chocolate in a heatproof bowl, and place it in a very low oven [about 150°F (65°C)], stirring once or twice with a rubber spatula, until smooth and melted, 10 to 15 minutes. If melting in the microwave: Place the chopped chocolate in a heatproof bowl. Heat it in 15-second bursts at medium power, stirring with a rubber spatula between each heating, until smooth and melted. 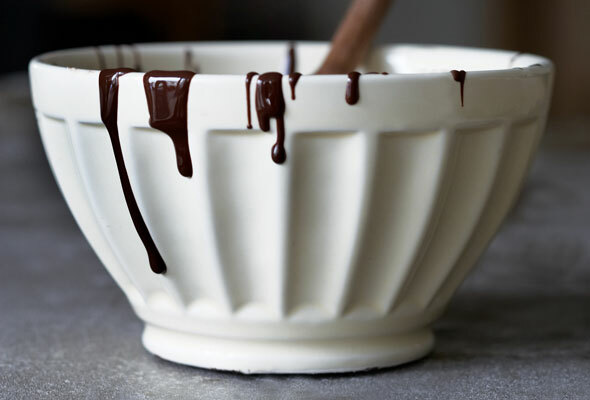 If melting over simmering water: Place the chopped chocolate in a heatproof bowl. Place the bowl over a pan of gently simmering water, making sure that the water doesn’t touch the base of the bowl, and stir occasionally with a rubber spatula until smooth and melted. 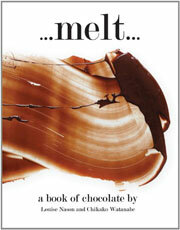 Melting Chocolate Recipe © 2011 Louise Nason and Chika Watanabe. Photo © 2011 Jean Cazals. All rights reserved. All recipes and photos used with permission of the publisher.